This concert is sold out. A waitlist will begin starting at 6pm at Crowell Concert Hall. "The Kronos [Quartet] continues with undiminished ferocity to make unprecedented string quartet history." 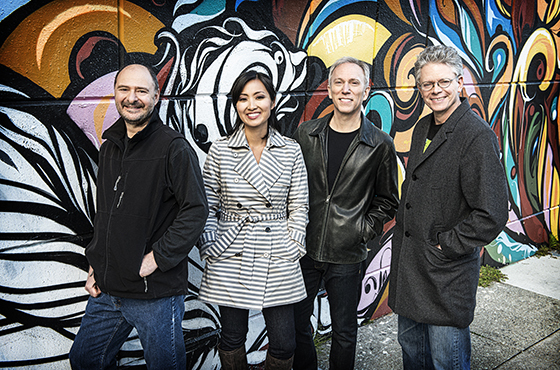 Founded by violinist David Harrington in 1973, the quartet includes John Sherba on violin, Hank Dutt on viola, and cellist Sunny Yang. The program will also feature performances of Pete Townshend's "Baba O’Riley," Islam Chipsy's "Zaghlala," N. Rajam's "Dadra in Raga Bhairavi," Konono N°1's "Kule Kule," Yevgeniy Sharlat's "pencil sketch," Fodé Lassana Diabaté's "Nana Triban" from "Sunjata’s Time," Nicole Lizée's "Another Living Soul," Rhiannon Giddens' "At the Purchaser's Option," Aleksandra Vrebalov's "My Desert, My Rose," Tanya Tagaq's "Sivunittinni," Mario Galeano Toro's "Microsurco de Liebre," and Terry Riley's "Good Medicine" from "Salome Dances for Peace." The Kronos Quartet previously performed at Wesleyan in May 2001.